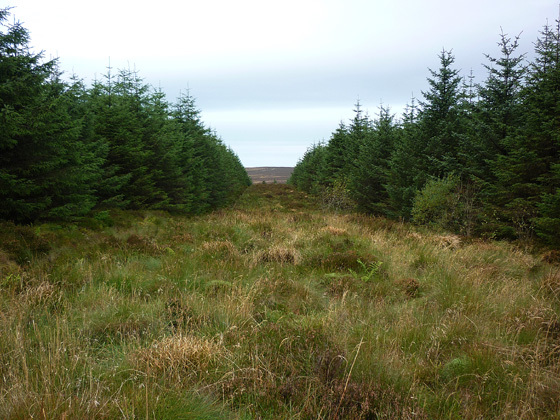 The Irish name, Sliabh Bán, is fairly transparent. However, the origin of the English name, Soarns Hill, is obscure. It may be derived from Ir. sorn, 'kiln', but the hill seems rather too high and remote for this. There were limekilns near the coast at Carnlough. Soarns Hill is the 923rd highest place in Ireland. Climbed Soarns Hill to-day (17 Oct 09) as one of the 100 listed hills nearest to my home. I used three5four0's very helpful route description. The following additional information may be useful. The second farm up the lane is called "Cleggan Cottage" and is a short distance from the old gate mentioned by three5four0. This gate and the right turn immediately after it are at D2080011150 G. The next gate is still padlocked and is the entrance to Cleggan Forest with a name board to the left. After the gate the turn to the left off this track is at D2130012700 H and heads NNE for about 700m to D2155012300 Iand the next left turn. Seven hundred metres along this track is the firebreak which goes to the top. It is at D2090013600 J and heads NNE. Although only 500 metres long it is the sting in the tail for this walk. The going is heavy without any sign of a path. Clearly a road less travelled. Once at the top an important point must be made regarding the summit at 403m. * three5four0 suggests that you can descend to the track by a shorter route down the firebreak going NE, this should in fact read NW and takes you down to the track at D207143 K where a left turn takes you along past the firebreak taken earlier to the top. From there simply re-trace your outward route. three5four0 did this walk on a rainy day. To-day was dry and bright and the views across to Slemish and the hills along the edge of the Antrim Plateau were very pleasant indeed.